Emmy-winning talk show host, comedian, actress, and generally delightful person Ellen DeGeneres has a gift for making people laugh. Her beloved daytimes series The Ellen DeGeneres Show is basically a televised mood-improver thanks to her hilarious interviews (especially when she scares or pranks her guests), those classic taped segments, and, of course, the dancing. But sometimes the funniest thing about the show is Ellen herself, namely her contagious, hearty laugh. Ellen's guests can often steal the spotlight (especially when they are admitting some headline-grabbing secrets), but the reason the show has remained such a huge success over the years is thanks to the bubbly, spirited host. Whether it's a gut-busting anecdote from a celebrity, or an unexpected reaction from a fan, Ellen's laugh can be infectious. And you definitely can't blame her for cracking up on the show, some seriously funny things happen! If I worked there, I'd have a hard time keeping a straight face, too. Since Ellen has a knack for making us laugh, I thought it'd make sense to look back some of the times she had a laugh attack herself. (Hey, she's earned it!) 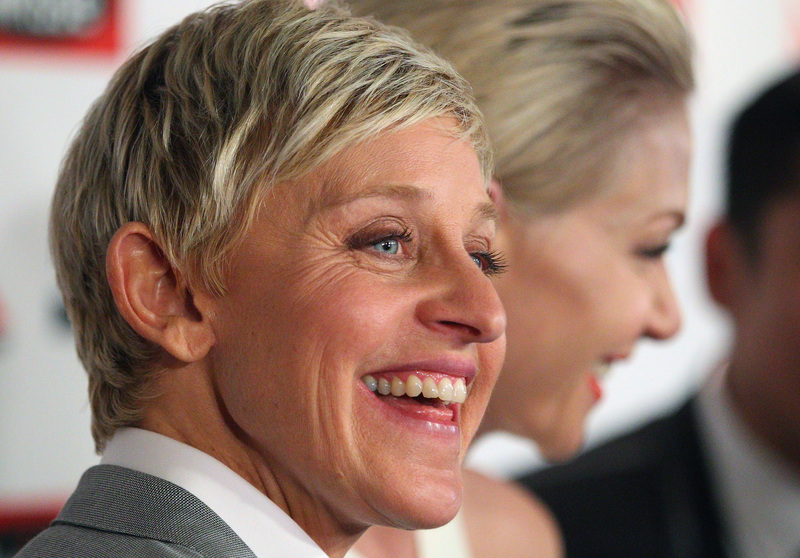 Here are six clips that prove Ellen's laugh is often the funniest thing to happen on her show. An oldie, but goodie. Gladys was the ultimate pistol and maybe Ellen's most entertaining fan ever. She had us in stitches, too. Like Ellen says, things don't always go smoothly on The Ellen DeGeneres Show, but it still makes for good TV. The only person who can give Ellen a run for her money in the laughter department is her executive producer Andy, as seen in this hilarious outtake clip. Sorry, professional comedians, these folks may just have you beat. Especially if Ellen's laughter is any indicator. I don't know who gets a bigger kick out of these segments, the audience or Ellen. One thing is for sure, the celebs getting scared are enjoying it the least. Especially when it comes to knowing how to give Ellen a case of the giggles.